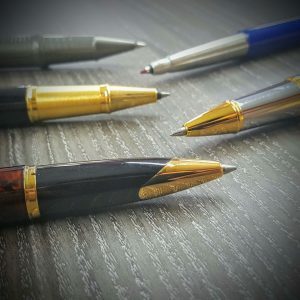 Is this the most successful pen in the world? 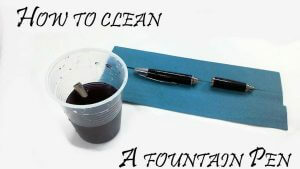 Home > Fountain Pens > Is this the most successful pen in the world? 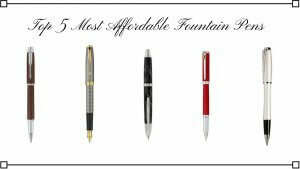 One of the earliest solutions, surprisingly still used to this day, is the retractable nib. 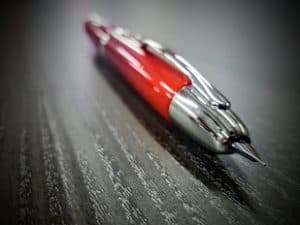 Pens were manufactured with a moveable nib and feed section with a screw thread on the inside of the barrel which matched up to a thread on the outside of the feeder which carried the nib and screwed up inside the barrel. A sealing washer, usually of cork (not many synthetics at this time) helped to stop leaks, known as the ‘Safety pen’ this attempt was used by a number of pen manufacturers, but wasn’t always successful. 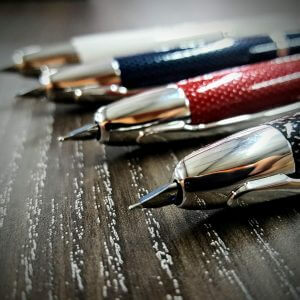 For a look at a modern retractable nib pen seek out the Mont Blanc Boheme range, which are short ‘pocket’ or ‘handbag’ pens, often with a synthetic coloured ‘jewel’ adorning the clip. A rather more complex design was one championed by Onoto, the pen making arm of the De la Rue Company, best known for their security and bank-note printing, Titled on the barrel as ‘Onoto THE pen’ it is alleged that the name was chosen because it sounds the same in all languages. 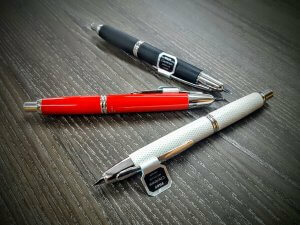 They produced high quality pens in BHCR (black, hard chased rubber, produced using the vulcanising process patented by Charles Goodyear in 1844 and used for making tyres. 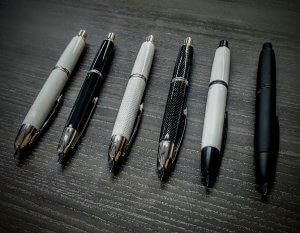 With the 1920’s and 30’s came many innovations in pen manufacture, including new materials such as celluloid – bringing an enormous variety of colours and innovative filling systems and the first sight of a ‘click’ action retractable nib pen in the 1922 film ‘Dr Mabuse der Spieler’ Directed by Fritz Lang, there is a scene where Dr Mabuse brings out a pen and presses down on the end of the barrel, writes some word then presses the end of the barrel! By 1932 the first firm evidence appears with the launch of the ‘Pullman Pen’ by the French company Meteore. 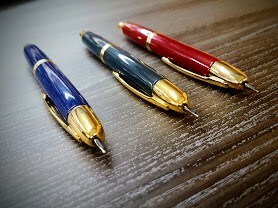 This looks remarkably like the modern day Pilot Capless, using a push-button (click) action at the bottom of the barrel, differing only where the tiny door that seals the nib and feed is outside the barrel unlike the Capless, where the door is concealed inside the barrel and the main material is rippled multi-coloured ebonite rather than modern day metal. In 1934, Italian company Aurora launched the Asterope which exposed the nib using button sliders to push the nib outwards and to retract it. 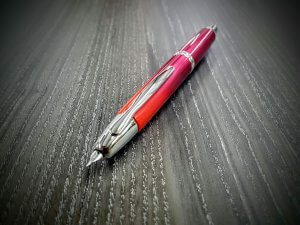 Then in 1964, Japanese company Pilot Namiki introduced the Capless/Vanishing Point to coincide with the Tokyo Olympic games. 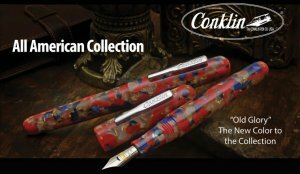 Beautifully constructed, this is a serious pen, yet sales were mostly confined to Japan, with some being brought to the US with returning US Service Military and business people, until…. 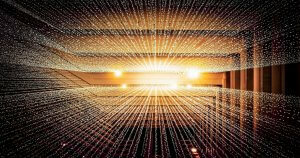 The Internet burst into life and EBay arrived resulting in many items hitherto restricted to Japan and their immediate neighbours being made available to the wider world. 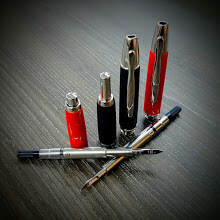 Pilot subsequently went on to market the Capless world wide with special editions, new finishes and colours understandably gaining fans across the globe. Next post: What is the write size?